Sediments are a natural part of aquatic systems and they are essential for the hydrological, geomorphological and ecological functioning of those systems. For society they are important and represent an important resource. However, due to the ever increasing use of river catchments, sediments need to be managed in a balanced and sustainable way. Sediment Management at the River Basin Scale reviews some of the key requirements and challenges facing scientists, river basin managers, and policy makers for sustainable sediment management at the river basin scale, and puts forward important recommendations. Chapter 1 - Sediment behaviour, functions and management in river basins (P.N. Owens). 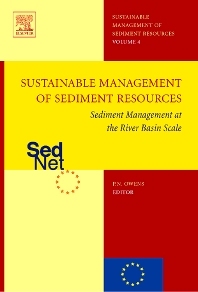 Chapter 2 - Conceptual and assessment frameworks for sediment management at the river basin scale (S. White, S. Apitz). Chapter 3 - Regulatory frameworks for sediment management (S.T. Casper). Chapter 4 - Sediment and contaminant sources and transfers in river basins (K.G. Taylor et al.). Chapter 5 - Decision support tools for sediment management (M. van der Perk et al.). Chapter 6 - Costs and benefits of sediment management (A.F.L. Slob et al.). Chapter 7 - Sediment management and stakeholder involvement (A.F.L. Slob et al.). Chapter 8 - Sediment management at the river basin scale (P.N. Owens et al. ).